Where to start? Right now I’m having a wonderful Manhattan , made with Gibson’s Finest Rare 12-year-old Canadian whisky (which back in the day meant rye whisky, but probably a rye-and-wheat mix—I’ll have to get some genuine rye: Crown Royal Northern Harvest or Odd Society Prospector (scroll down)), Martini & Rossi red vermouth, and a dash of Angostura, of course. (The great cartoonist Vip – Virgil Partch – did cartoons for their ads for years. “Don’t forget the Angostura!” It’s burned into my brain.) Example at right. But for the past few hours I’ve been letting this flat-iron steak rest at room temperature (“tempering” the steak). 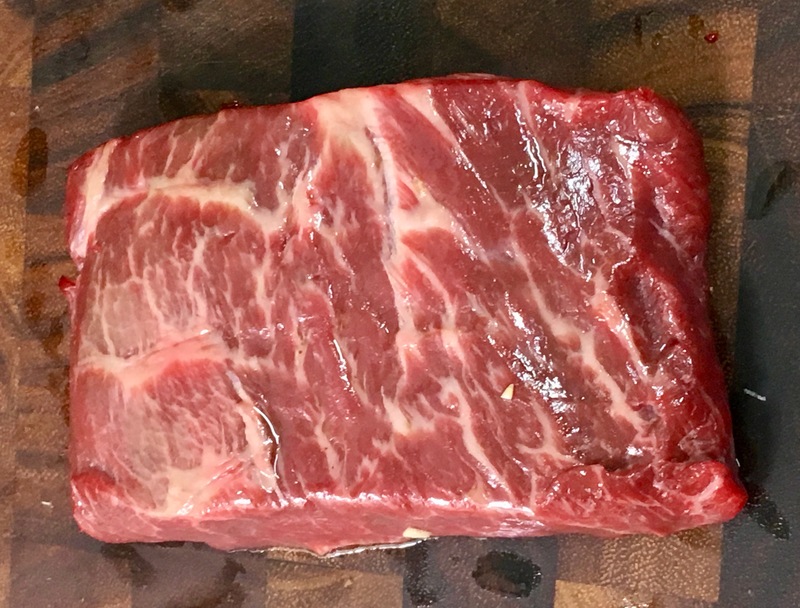 Note the unusual grain, running lengthwise through the steak rather than across (as the in T-Bone, Porterhouse, rib-eye, NY/KC strip steak, etc.). It’s a very tender steak, however. In the photo I have already applied a thin coating of extra-virgin olive oil. I cooked mine this way in my No. 8 Field Company pan, which I heated in an oven to 500ºF, and using the sauce described at the post. 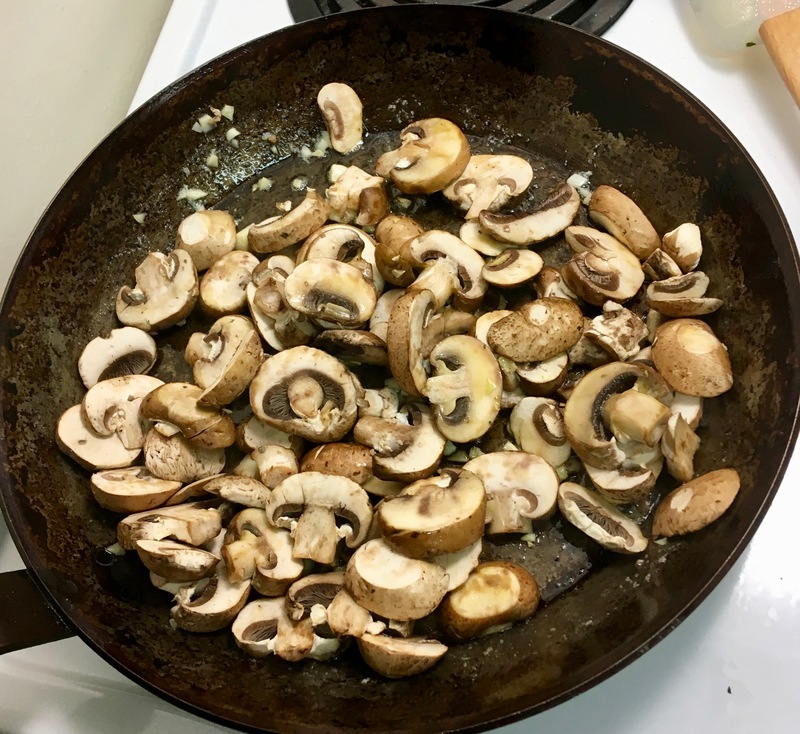 And while the oven came to temperature, I used this recipe to make 8 oz sliced Crimini mushrooms (scroll down). 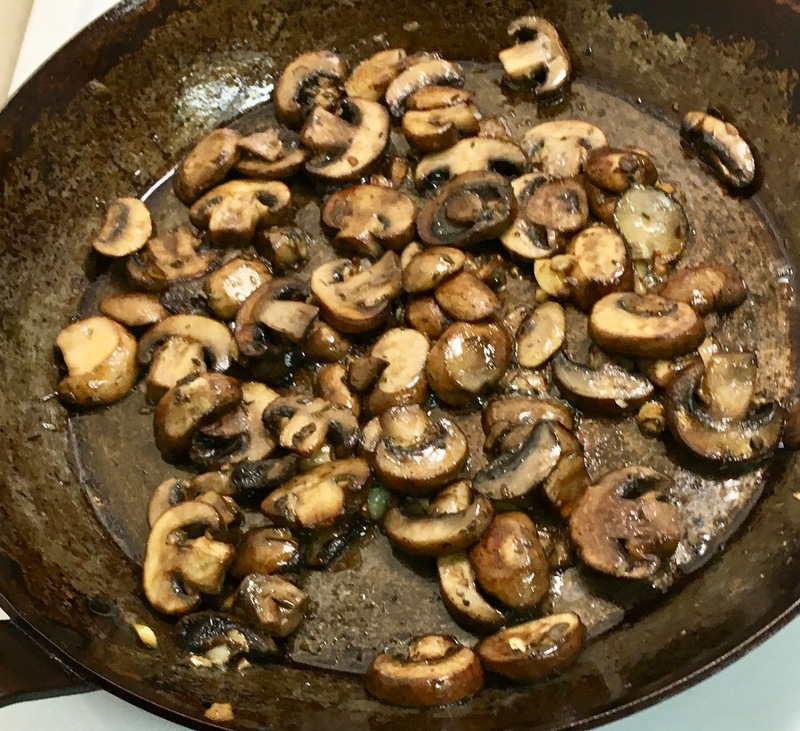 I discovered that my 11 7/8″ Matfer Bourgeat carbon-steel skillet is ideal for this. It provides a lot of room, and I can heat it on the range top rather than in the oven. And, like the cast iron, it is nonstick. With the steak and mushrooms I had a glass of an inexpensive Côtes du Rhône. And to add to all that, I’m reading “Darwin’s Dangerous Idea,” which offers an escape when the Amazon Prime Video “Hanna” becomes too tense. I do think translating the movie into a series is working well: makes you more conscious of the texture. When Peter Hunt set out to create a gin to celebrate the centennial of Victoria’s historic Fairmont Empress Hotel, he chose both classic and unique botanicals. There would be plenty of juniper and coriander for old-world style, plus contemporary touches of lively grapefruit peel and ginger root. 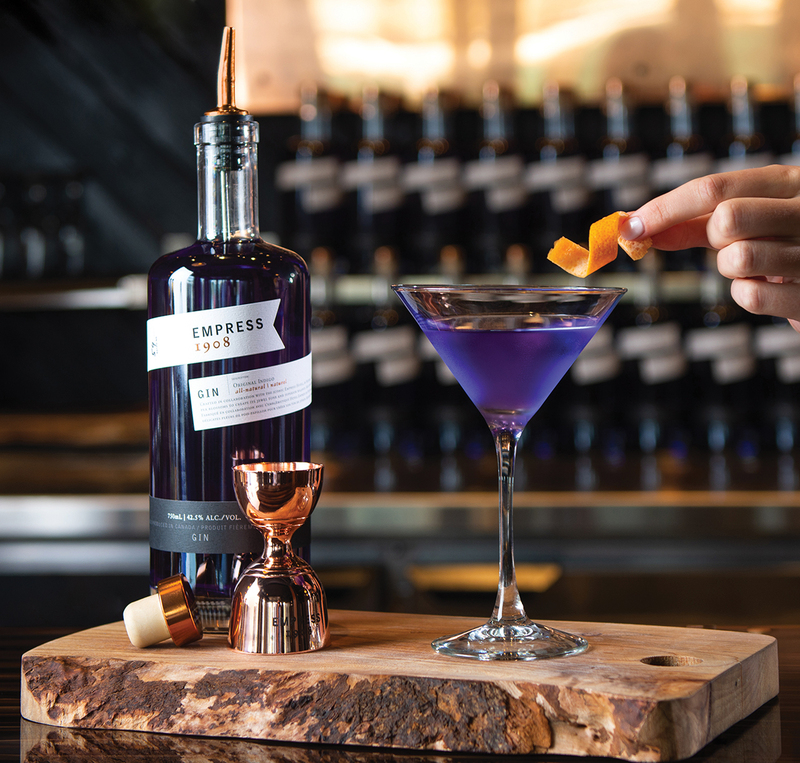 But the most unique addition to the Empress 1908 Gin was a blue butterfly pea blossom from Thailand, which tints the gin a very royal purple and has made the spirit a hit both here and abroad. “Empress 1908 Gin may soon be Canada’s most popular premium spirit export,” says Hunt, Victoria Distillers’ young president and master distiller, whose indigo gin recently surpassed Hendrick’s as the most popular premium gin sold in the province, and is now selling across Canada, in 22 U.S. states, and in the U.K. and Japan. Hunt is the son of Bryan and Valerie Murray who opened an artisanal distillery called Victoria Spirits in 2008. They produced the eponymous Victoria Gin whose original bottling, with the image of a young Queen Victoria on the label, was launched at the Empress. 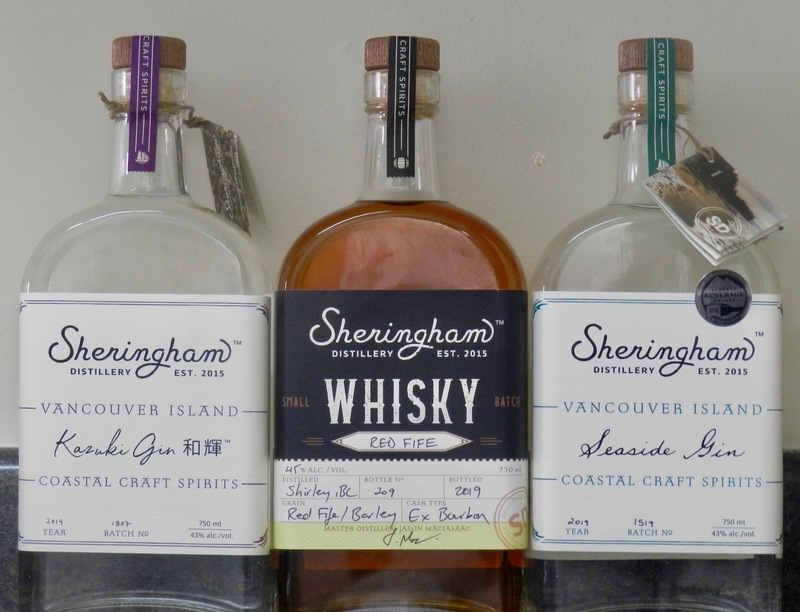 In 2015, the Murrays sold the company to Grant Rogers of Marker Group, and he expanded with a new larger distillery and tasting lounge on the waterfront in Sidney, rebranding as Victoria Distillers in 2016. Peter Hunt remained with the new company as president and master distiller. With the new gin so wildly popular, he is preparing to install a third still at the small Vancouver Island distillery to keep up with demand. “Our production has increased tenfold in the last year,” he says. Empress 1908 Gin is now the flagship spirit for Victoria Distillers, a boutique distillery which, like many, started with a dream of making whisky. Gin was a way to help distinguish the brand while the brown spirits aged in barrels, but Hunt says their whisky, rum and bitters projects have been eclipsed by their bold new gin. How the colourful butterfly pea blossom ended up in the botanicals for Empress 1908 Gin is a fascinating story. Hunt says he was experimenting with various botanicals, including some of the signature Empress Hotel afternoon tea blends, while working on the new spirit named for the year the historic hotel opened. The intense royal-blue colour was accidental, says Hunt, a result of infusing the Blue Suede Shoes blend of green tea and butterfly pea blossoms into a batch. When the gin turned colour he says he thought it was a nonstarter. But the gin, which so perfectly complements the amethyst accents in the new décor of the hotel’s modern Q bar, found instant fans. Soon hotel guests were grabbing a cab to the one government liquor store in Victoria that was selling the new spirit to buy a bottle. The other exciting and unexpected side effect of this infusion is its ability to . . .
Continue reading. There’s quite a bit more. Asparagus was selling for $3 for a large bunch, so I got 3 bunches. I can use some up in my breakfast, but I now have more than enough for that. So after thinking about it, I came up this idea: I put my No. 12 Field Company cast-iron skillet in the oven and turned it to 350ºF to heat. It’s too large to heat well on the burner, and the walls would not get heated at all (cast iron being a poor conductor of heat). Heating it in the oven heats it uniformly and fills its rather large heat capacity. 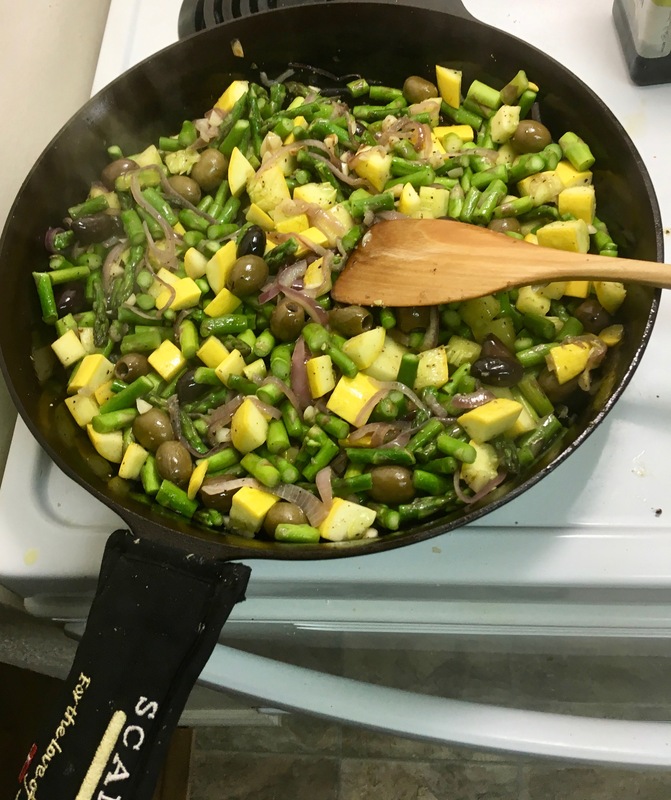 When the onions are softened and transparent, I’ll add the garlic, cook that a minute, then the asparagus and squash and cook that, stirring occasionally, for 12-16 minutes. 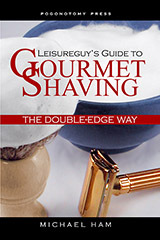 Wish I had some grated or shaved Parmesan Reggiano or Romano Pecorino. And tonight I think I’ll have a tipple of Red Fife. 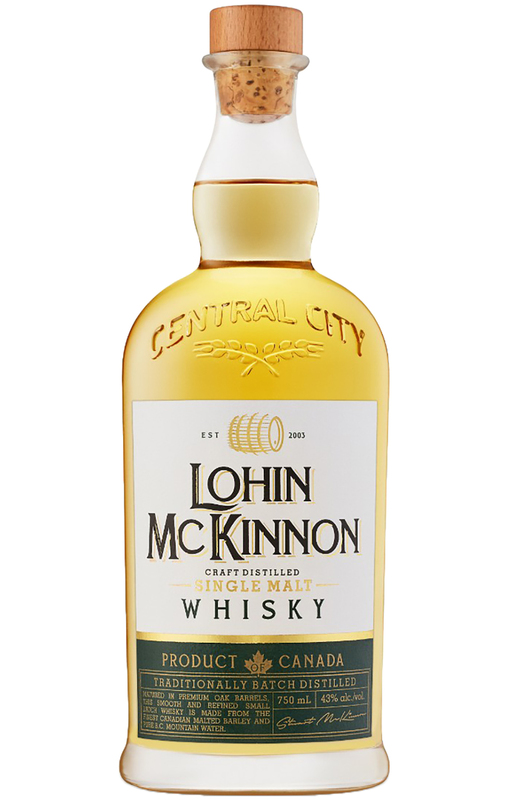 This was their very first batch of whisky—although aged in bourbon barrels, the whiskey is from barley, like Scotch, not corn (sometimes with wheat), like bourbon, and not rye, like rye whisky. It’s sold out already. Next batch will, I assume, be a year from now. Update: This is the finishing salt I used on the veg, along with the lemon juice: rosemary garlic. Nice. I walked 38.9 minutes but took a few more steps so still came out to 106 steps/minute. I did note some heavy breathing as I walked: I can feel the effort. A while back I bought a quart of Farm & Field’s “Hearty” bone broth, whose ingredients include beef bones, duck bones, and pig bones. When it’s icebox cold, it’s totally gelled. Every time I open the freezer door, I see the quart I bought, still frozen, so tonight I thought I should put it to use. I used my 6-qt stockpot because it’s a 10″ pot and I wanted to sauté the ingredients. The larger diameter helps with that. I’m not going to make all that much soup (probably around 2-3 quarts), so I can transfer the soup to a smaller pot to refrigerate it. I put all that in the pot, turned heat to medium-high, and sautéed it for several minutes, until I felt the vegetables were getting cooked. I simmered that 10 minutes more, stirring occasionally. Surprisingly rich and tasty—that’s the bone broth, I’m sure. A while ago I ordered bamboo cocktail toothpicks, and I decided to go with 4.5″ rather than 3.5″ (which I had before). They’re wonderful. I took them out of the plastic bag and secured a strong rubber band around the whole quiver of them, and it’s easy to pull one out of the pack when I want a Martini. And—unexpected bonus—the 4.5″ pick holds five (queen-size) olives. The old ones could hold but four. I used Tempo Renovo Dry Gin, which (it’ll have you know) is a Vancouver Dry Gin, not a London Dry Gin. Here’s the site, and click the “Tempo” button. It is in fact a very smooth and polished gin with a very nice flavor. I would rate it top-notch. The bottle, FWIW, is heavy: it would be a good defensive weapon in a bar fight. The above is from this post, which I found as I searched for sweet vermouth comparisons. I had been using Cinzano and just recently got a bottle of Martini & Rossi instead, and it struck me as much better. And I saw a long list of sweet vermouth ratings, including that above. I have often gotten Antica Carpano Formula, and I think I will soon get another bottle. It really is excellent, but I have to say I’m impressed by the Martini & Rossi. Update again. Whoa! 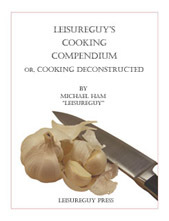 Do a Google search on “Sweet vermouth recipes” (or, for that matter, on “Dry vermouth recipes“) and you find plenty that will keep you busy. I have to say, as a guy who makes his own pepper sauce and (occasionally) his own Worcestershire sauce and mayo, consuming your own version of what is commonly purchased is wonderfully satisfying. 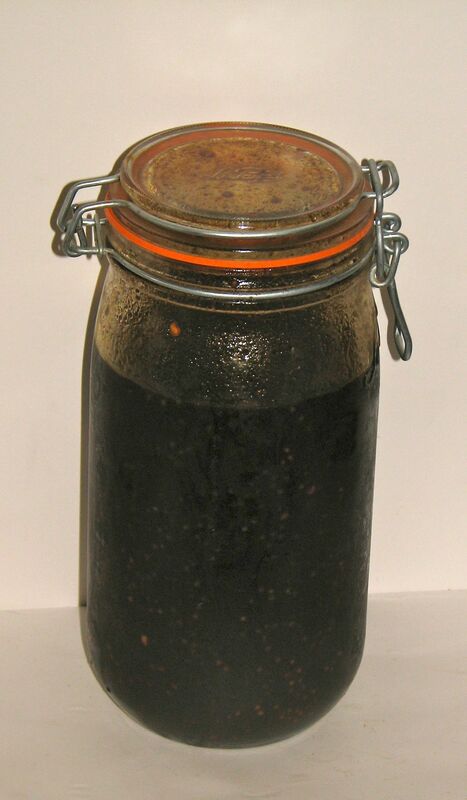 You will need a 5-quart jar with a lid and a clean, empty 750-ml bottle. Serve over ice with an orange twist as an accompaniment to green olives, Marcona almonds and orange wedges. To read the accompanying story, see: The best vermouth you can sip is the one you can make yourself. Make Ahead: While it may be sipped straight away, vermouth takes a month to fully meld flavors. The bottles can be stored for up to 3 months. Once opened, refrigerate for up to 1 month. Combine the sugar and water in a medium saucepan over high heat. Swirl the pan, do not stir, and keep constant watch. Cook for 12 to 15 minutes; the resulting syrup will begin to turn a light amber color. Add the strips of orange peel, continuing to cook and swirl the pan as the syrup gets richly caramel-colored, for 6 to 8 minutes. Remove from the heat. Add the brandy to the pan. The caramel syrup will seize, in what seems like a truly terrible moment. Return the pan to the stove top and reduce the heat to medium-low. Cook for 10 to 15 minutes, stirring with a sturdy spoon as the caramel melts into the brandy. Do not let the brandy come to a boil. 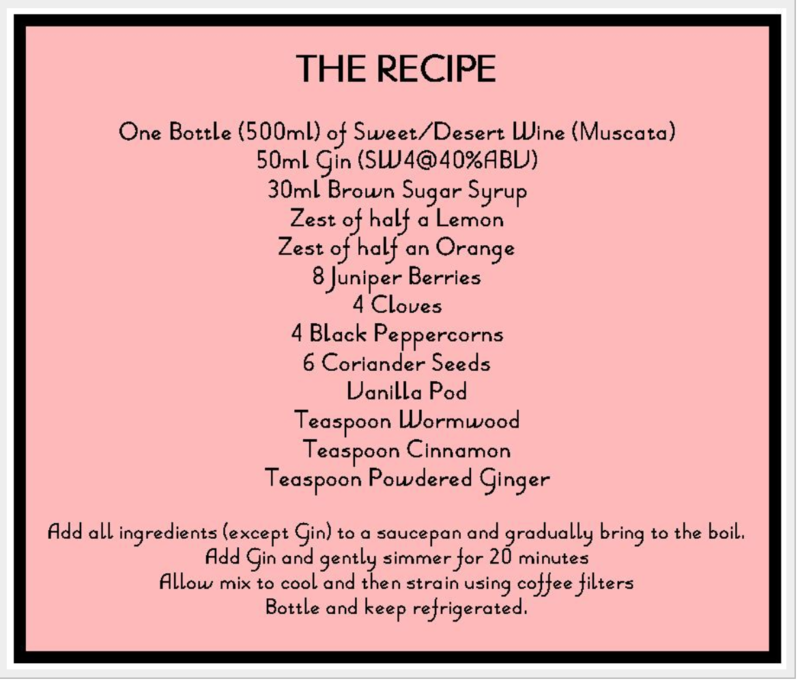 Pour the warm brandy mixture into the jar, then add the cloves, coriander and cardamom seeds, pink peppercorns, star anise, nutmeg, saffron and vanilla bean. Cover/seal the jar. Once the mixture is cooled completely, add the sherry and then close the jar again. Let this mixture steep overnight. The next day, strain the infused brandy and sherry mixture through a fine-mesh strainer or a strainer lined with cheesecloth. Add the 2 bottles of wine, stir well, and, for efficiency, pour the DIY vermouth mixture back into the 2 empty wine bottles plus 1 additional empty bottle. Cork or twist the caps back on and place the bottles in a dark closet for 1 month. I don’t know whether this is available in your country, but it is amazingly tasty. More info here. Kazuki Gin was born out of love of both Eastern and Western botanicals and gin making techniques. Alayne fell in love with Cherry Blossoms while living in Asia and Jason became intrigued with Yuzu as a professional chef. KAZU, meaning “harmony”, is the blending and respect for both East and West cultures. KI means “radiance” and is an ode to the radiant flavours of the botanicals as they dance on your palette. Cherry blossom petals and yuzu peel were imported from Japan. From Westholme Tea Farm we procured green tea leaves and flowers. Expect dynamic flavours from start to finish with the unique essence the Kazuki provides. Made from our Vodka, with botanicals sourced locally and from Japan, including Japanese Cherry Blossoms and Green Tea + Flowers from Westholme Tea Farm in Cowichan Valley. Citrus, floral and notes of the sea make our Gin as refreshing as a seaside stroll. Elegant for sipping and noble in your favourite cocktail…clean as the South Island surf. 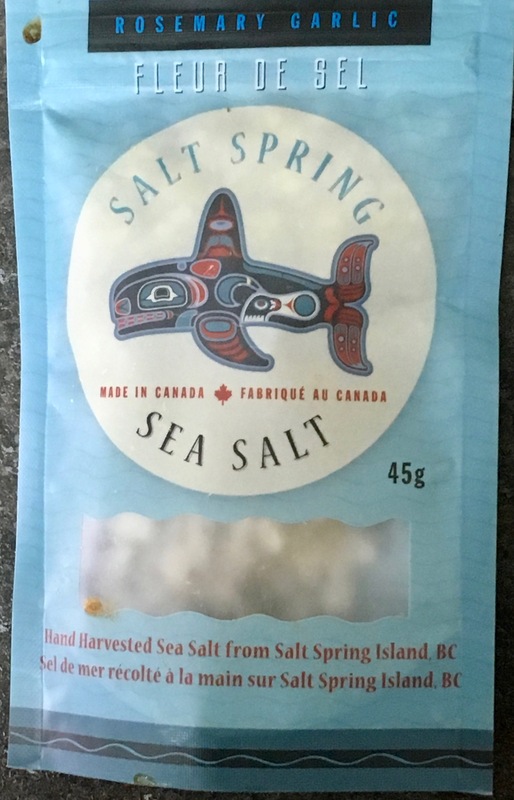 Made from B.C. white wheat, B.C. malted barley, natural botanicals and sustainable hand-harvested local winged kelp (Alaria marginata). Red Fife Whisky was launched just today, so it is not yet on the website. I got bottle #209.